The beauty and mystery of an ever-changing seascape add to the infinite appeal of Silver Mermaid Sequin, a new sequin that captures the essence of mystery and never fails to stimulate the imagination. 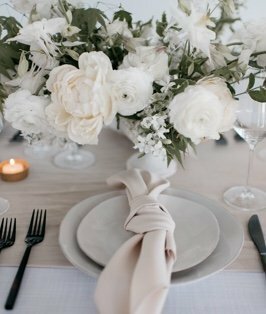 There are myriad ways to personalize an event tabletop with this uniquely adaptable linen, and it's as easy as smoothing the fabric with a sweep of the hand. Create artistic masterpieces that call to mind surging ocean waves, or capture another vision by shaping symbols to match another mood. The metallic glow of Silver Mermaid Sequin will add elegant life to any celebration.